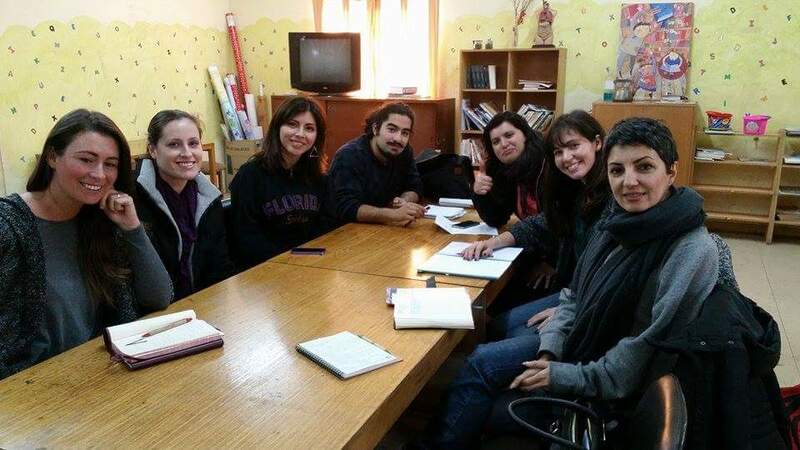 Yesterday Ojos Abiertos visited Liceo Almirante Riveros in Conchali for a meeting with the teachers. The school is a public one, located in one of the oldest suburbs in Santiago, that originally comprised Huechuraba and Recoleta. Visually it looks the same as Recoleta, although its streets can be much narrower and smaller..The houses are still a mix of color and iron fences, the roads still have holes and the people are still a mix of friendly and wary. The school is a shining light in the area, despite being the last option for children refused entry into other schools. Before its director, Gerhard, joined a few years ago, violence levels were sky high and today many of the students are considered to be at social risk due to lack of support and positive influences in their lives. Maria Violetta, one of the English teachers, explained to us that it can be difficult to motivate the students, some of whom disappear for weeks at a time. Despite this, the school is doing great things thanks in no small part to Gerhard, who has brought music and art to the school in a life-changing way. Yesterday we entered the green doors of the school with nervous anticipation. It was 3.25pm but the school was still packed due to the numerous talleres that run after-school hours. We walked past teenage boys dressed in sport label galore and smiling children who ran past with a “Hello Kitty!’ Immediately as you enter you arrive into a large concrete space with walls decorated with murals and a small tuck shop selling snacks. Cueca music was blaring “La Consentida” as teenagers “practiced’ their dance moves in preparation for Fiestas Patrias, Chile’s national Independence celebration that runs for a week and culminates with a grand Dieciocho day of barbeques, dancing and drinking (18th September). We could hear flutes and other instruments playing somewhere around, and everywhere we saw teenagers with piercings and baggy pants carrying music cases. Gerhard came to meet us and told us how excited he was about our upcoming activity classes. It’s worth taking a moment here to know the principal. Gerhard Morhinweg has musician and artist as well as school principal behind his name and if you type his name into Google you will find numerous interviews detailing his passion and exceptional progress in the field of education. He is friendly, smiles easily and since arriving at the school a few years ago violence levels have come down signifiantly. This is a man that truly, truly cares for his students, and it is because of him that we chose Almirante Riveros as our school to work with. I mention to him that I don’t have much work and since I live nearby and the suegros seem to want to see Emilio every day, I am available to help out with more streamlined English classes for those who are very interested. This is when he introduces us to Andrea, a shy and happy 17 year old who dreams of going to university in the United States. “She is an exceptional saxophonist,” Gerhard tell us “and can get a scholarship to study music at Texas State University because she is that good. She just needs English.” Point duly noted, and I ask if there are other students like her held back by the lack of English. “Yes.There are many talented kids at this school that want to study overseas but they only have basic English, which is holding them back.” I tell him I will teach them in intensive English classes designed for their needs. Andrea is given the task of speaking to them and finding out possible class times. “If I know Andrea,” Gerhard laughs, “she will have that list done by tomorrow with a lot of names on it!” (he is not wrong, at the end of the meeting there are 8 interested in the classes!!). We all sit in the staffroom which consists of one large table and some broken sofas, but is generally quite nice. The meeting today is with the kindergarten and primary school teachers, though there are several absent due to illness. The ones we do meet are lovely – a little tired – but all friendly and open to our ideas. The more we talk, the more enthusiastic they become. Over the next hour we bounce ideas off one another, all of us enthused by each other’s interest. One of the music teachers whispers something to Gerhard but he doesn’t say anything to us. Mariana, sitting next to me as my occasional translator, asks what it was. “She wants to join the classes and learn English” Gerhard says sheepishly. I want to keep children and adults seperate so I ask her to speak to me after the meeting. The meeting wraps up not long after and I speak to her – a very smiley woman wearing bright colors who seems a bit nervous. She tells me she really wants to learn English because she loves it but she has always felt alot of shame trying to speak it. When I tell her I will give her private lessons if she can come to my home, she nearly cries with happiness and gives me a big hug. I have the time, so why not? She is Conchali born and bred, so I am sure she will have many interesting stories. Plus, she’s offered to improve my Cueca at the end of each class! Art Expression with English – Run by acclaimed artist Hoda Madi and accompanied by Georgina, these will be 45 minute classes for the younger school pupils. Four classes will be run each week for different age levels from kindergarten up to segundo basico and they will involve the introduction of different values, the expression of emotions through different mediums and then the translation of this into art. These classes start next week on a Monday and Thursday morning. Dance Classes with English – Run by Carolina, a professional with years of experience running similar dance and literacy programmes in New York City. These classes incorporate different dance styles and English language instruction and begin today (September 1, 2015). Art and Recycling with English – Run by artist and curator Natalie and linguist Mariana, these classes are for older students and combine art projects with recycling and English languge learning. Each project is roughly two weeks in length, and will begin in October. Intensive English – Run by Helen. These classes for students in their final years of school who are thinking about options for when they leave. These classes are particularly for those thinking about working with the language, moving overseas or applying for university scholarships. These classes will also involve the learning of necessary skills such as interview preparation and CV writing. Begins next week. All of our classes are designed to “open the eyes” of our students to different possibilities, experiences, options and ways of thinking. They are much, much more than a class just about art or English, they are life lessons to do with the forging of values, respect and tolerance. If you would like to be involved, perhaps as a volunteer, a one-off seminar speaker or by setting up short-term projects of your own, please send me an email. Further if you would like to help but are unable to devote time, please think about donating art supplies or English languge materials (we can collect). We also accept donations (an email detailing how this money is spent will be sent to you and you will also be kept up to date about our projects and your donation). 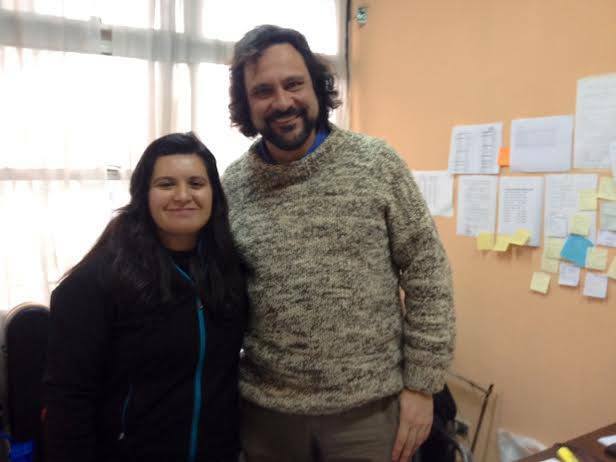 Second meeting at the school with Amaro, art teacher who also runs community art classes, and Maria Violetta, English teacher.